It all started in April 2013 when I rode the full distance Liege-Bastogne-Liege sportive, a day ahead of the pro-race, as the final day of Phil Deeker’s ‘hArdennes’ training camp. At the time, it was by far the toughest ride I’d done and it opened my eyes to what was possible. A year later, I was watching L-B-L and wishing I was there. By way of consolation, I decided to plot an equivalent ride in the UK. 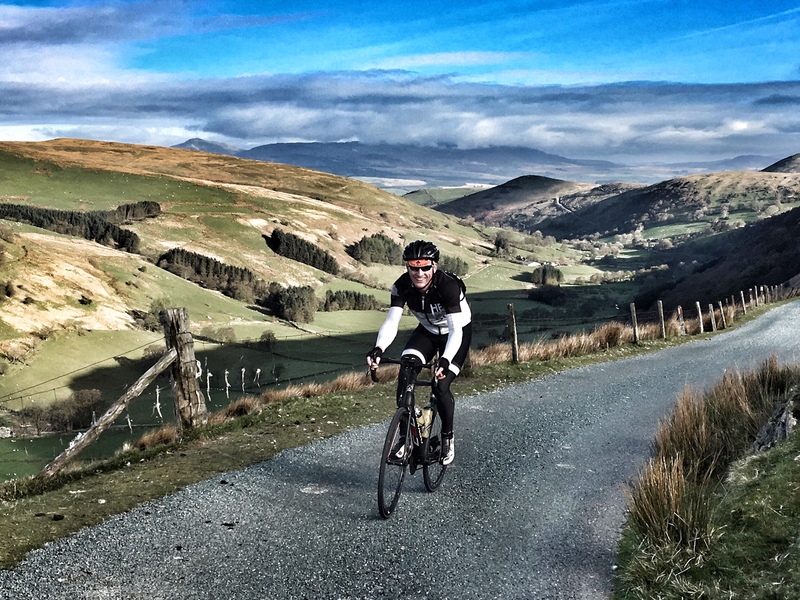 I chose the Aran Mountains in mid Wales – my favourite place to ride – and set about finding a 280km route with c. 5,000m of up. I knew the area really well and it didn’t take me too long to arrive at a fitting course. 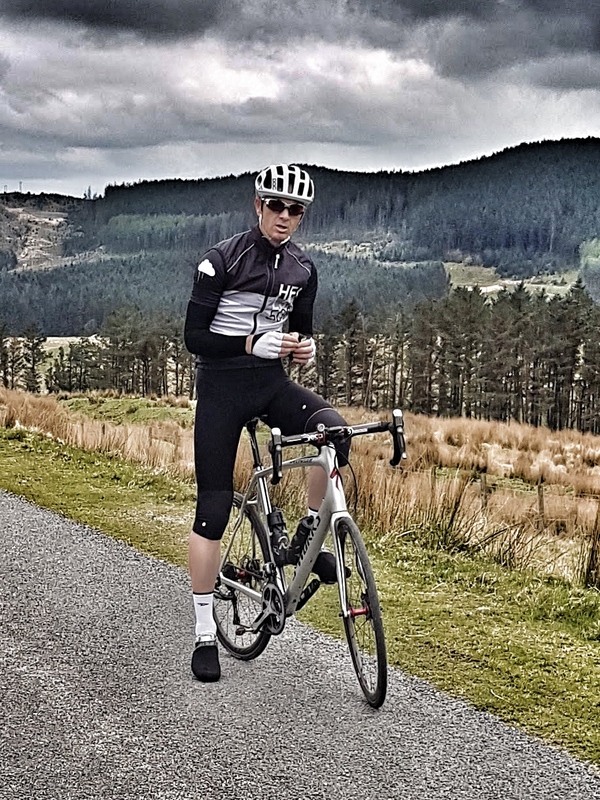 Like it’s Belgian inspiration, the route would start at it’s most northern point – Bala (Liege) – and run south to the turning point at Rhayader (km 125 – the equivalent of Bastogne), before turning back north for the remaining 160km back to Bala. It was a daunting prospect, but covered the best roads I knew anywhere in the UK. In the end, it took me three years to summon up the courage to attempt it and even then, it was a very last minute decision, when, on a Friday evening in April 2017, a time and weather window suddenly presented itself. My son Tom agreed we should go for it and I threw out a couple of other invites: to his great credit, one of these, a fellow Cent Cols rider called Charlie Sanders, said yes! Not many people would accept an invitation to ride 285km with less than 24 hours notice! One final thing struck me: we would be riding the route on Sunday 23rd April 2017, the exact same day that the pros would be riding Liege-Bastogne-Liege in Belgium: fate is a funny thing. I woke up with all the familiar nerves that come before a big test. At an early breakfast, very kindly hosted by my favourite local B&B ( http://www.bodiwan.co.uk/ ), Charlie, Tom and I attempted to take in as many calories as possible in a short space of time. We rolled away at 7.15am, in cold, crisp air and followed the shores of Lake Bala southwards. 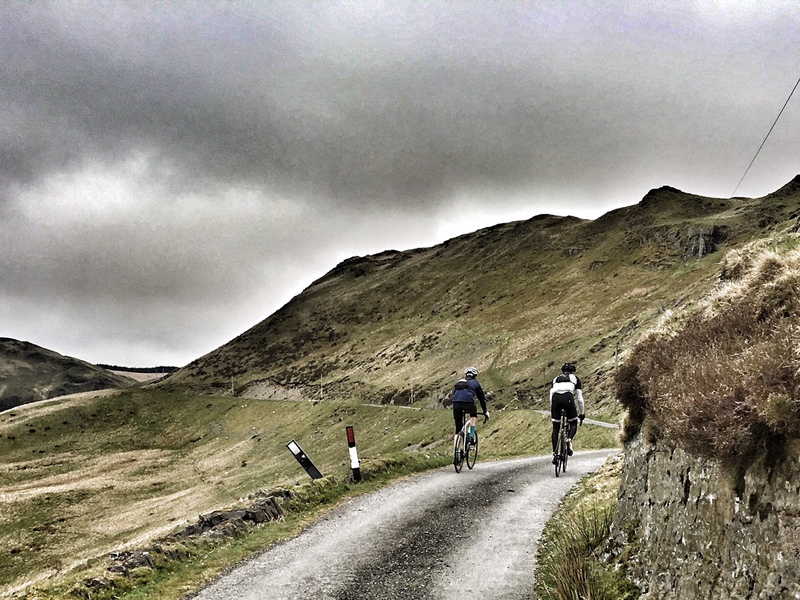 Our first climb was a classic: the north side of Bwlch y Groes (8.5km, 4.5% av). It’s not a difficult climb, but it’s long and we rode cautiously, conserving. We settled into the task at hand, making great time on the long transfer southwards, past Machynlleth and on to Tal-y-Bont. This was where the route turned inland and the real work began – the next 50km, first south-east and then back north west to Machynlleth, involved seven proper climbs and 1,500 m of ascent! A useful tailwind sped us on our way up the 8.3km climb to Nant y Moch and then through the deserted and beautiful Cwm Ystwyth. We continued to make decent progress, although I noticed that by the time we arrived at our turning point in Rhayader, our elapsed average was down to 20kmh. The clock was ticking and we needed to speed up; more accurately, I needed to speed up – Charlie and Tom were clearly soft-pedalling on the climbs. We’d planned to get food and water from local shops and garages to keep our stoppage time as short as possible, but allowed ourselves a brief cafe break in Rhayader. Bacon rolls, chocolate brownies and coffee helped us on our way. I apologised to Charlie and Tom as we headed back north. The ‘road’ I was using was so bad that it was no longer shown on major maps, but it avoided the traffic of the A44 and after the cobbles of Roubaix, not many roads put me off! I heard ‘dissent’ behind me however and suspected they’d take the A road if they ever came back! Back on proper tarmac at Llangurig and with 160km to go, Tom’s gears seemed to be slipping. Closer inspection revealed the stuff of nightmares: his rear dérailleur cable had frayed and was down to just the central strand of wire. If it snapped, we’d have to lock him into one gear. We asked him to change gears as little and as gently as possible and prayed that we might get to the finish without it snapping. 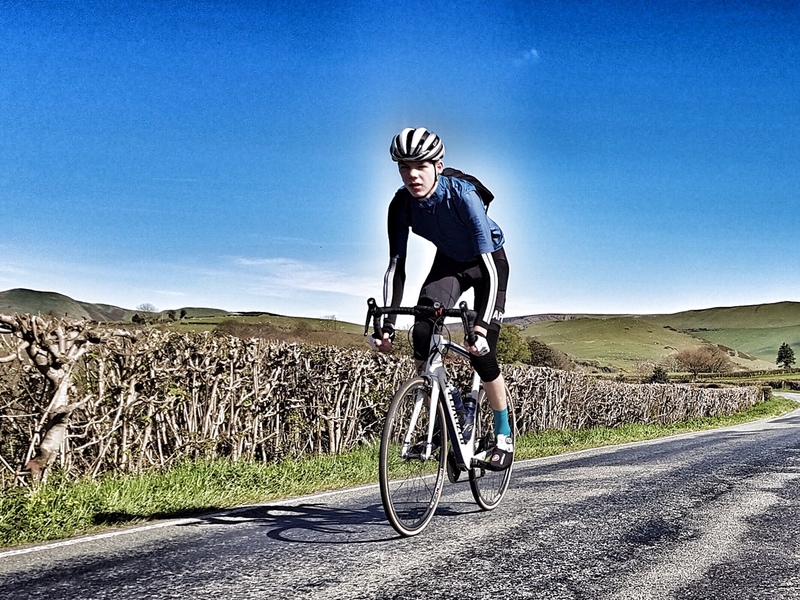 Tom, at 17 and on the biggest ride of his cycling career so far, took this news relatively well: in short, we were asking him to turn bigger gears and make life harder for himself. As if 285km and 5,000m wasn’t already hard enough! Onwards, up into the peace of Hafren Forest and then up even more, onto Mach Mountain, with it’s amazing tarmac and stunning views across to Cader Idris. Passing back through Machynlleth was a significant milestone. Yes, we still had 100km to go, but two thirds of the climbing was now behind us. We refuelled again and set off for the wonderfully named Happy Valley and the climb over to Towyn. We’d been fighting a moderate – and cold – headwind since Rhayader, but at Towyn we turned north-east and finally we started to enjoy a tailwind again. Our pace rose. 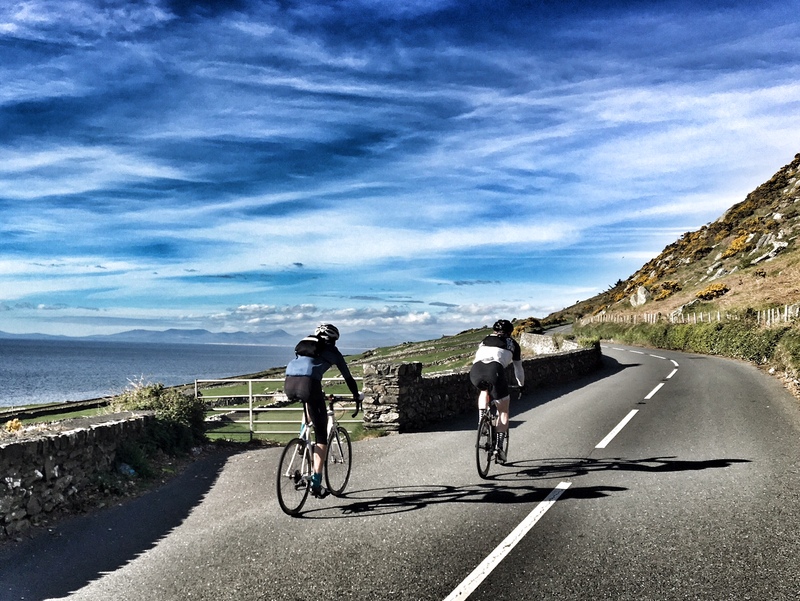 The coast road to Barmouth, including the famous old wooden bridge (trains, walkers and bikes only, no cars) was a real highlight, with the mountains of Snowdonia, the Lleyn Peninsular and Cardigan Bay providing a stunning scenic backdrop. It took our minds off how our bodies were feeling. We made out last water stop in Barmouth and headed up into the Coed-y-Brenin forest – the final hurdle. This was a tough finish, with several sections nudging 20% and numerous descents within the overall climb, meaning that it took us well over an hour to finally reach the gate that marked the summit of Bwlch Goriwared. It had been an eventful final push – the sun was now so low that it was completely blinding, the temperature had dropped to four degrees centigrade and a farmer on a quad bike had almost run us down – fair enough: why would anyone else be on these roads at this time on a Sunday evening?! We put back on all the clothes that we’d taken off since setting out this morning, turned on our lights, ate any food that remained in our jersey pockets and headed down the final 10km descent to Lake Bala. Four gates and a herd of cows kept us sharp! Sir Guy Litespeed: another fun micro adventure! Finally, 13 hours after setting out, we arrived back at the southern end of Lake Bala. In ‘team time trial’ formation, we sped back to the town, as the last of the light seeped into the west and darkness took over. The finals stats weighed in at 285.6km and 5,041m of climbing. Moving time was 11:48:51 hrs. And finally, amazingly, Tom’s gear cable didn’t snap! Photos by SGL and Charlie Sanders.